Tis the season of boat chores. Some we are opting to handle ourselves while others are being farmed out either due to the value of time vs money or due to the fact that the task is outside of our comfort level. While I’m learning a lot I’m also learning that since we are working 40+ hours a week sometimes its better to pay someone else to do the task instead of burning our afternoons and weekends doing it ourselves. When we purchased this boat I’m sad to say we didn’t double check our surveyor as well as we should have. 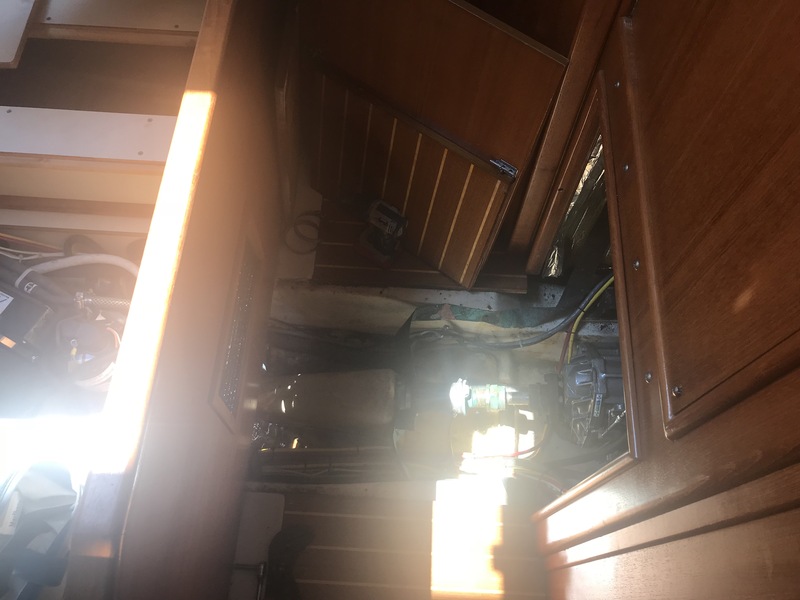 While we certainly got a very good price for the boat even with all of these repairs these should have been caught and frankly its just more reinforcement that the surveyor is for the bank and that you should survey a boat separately for yourselves. Its still a buyer’s market so the additional time shouldn’t be an issue for a broker or seller. If they balk walk away. None of the items are things that I feel the seller was hiding. I think they were just maintenance items that are way over due. The benefit is I’m getting to know all of the systems on this boat much more than if it had been completely turn key. 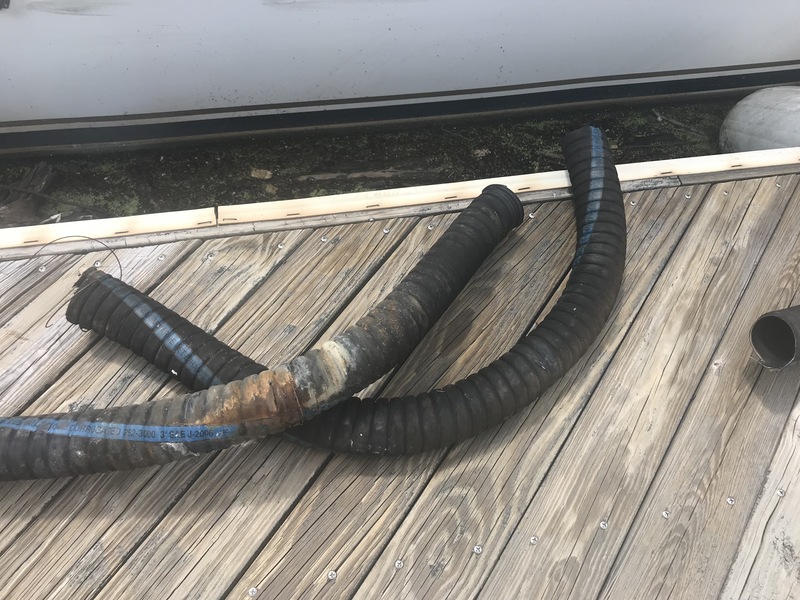 The biggest maintenance item that was completed recently was a new exhaust tube from the engine to the muffler and from the muffler to the thru hull. The run was approximately 18 inches for the first one and 12 feet for the second one. 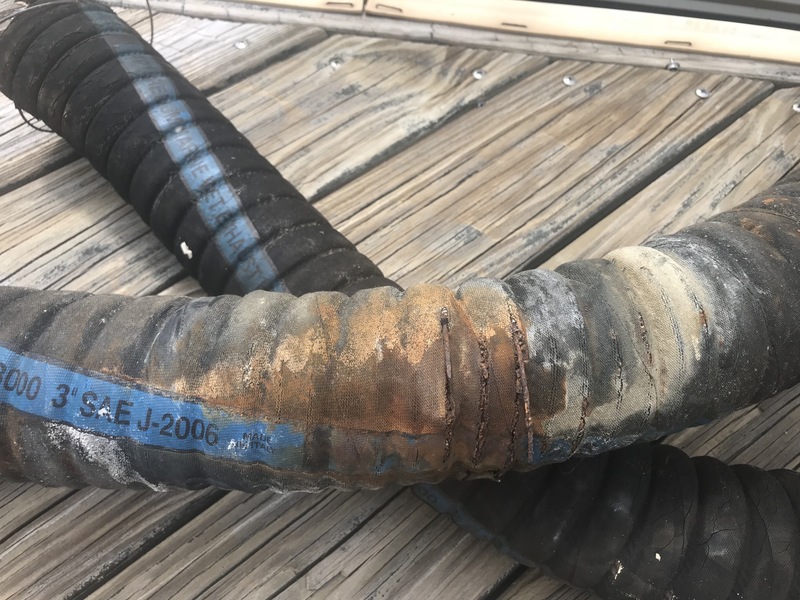 The tubing is #252-3000 double wall wet exhaust tubing and unfortunately it has been improved since the original exhaust was put in. The new exhaust was slightly thicker making it a pain to get into the tight spaces. While I’m sure I could have done it given enough time we are still in a position where time is rare so we hired it out. Lets just say it was over due. It started off with a partial disassembly if the aft cabin bed. The good news is we finally pulled out all of the spares that were stuffed in there. The bad news is that we found a new project based on the smell. Expect more on that in a future post. 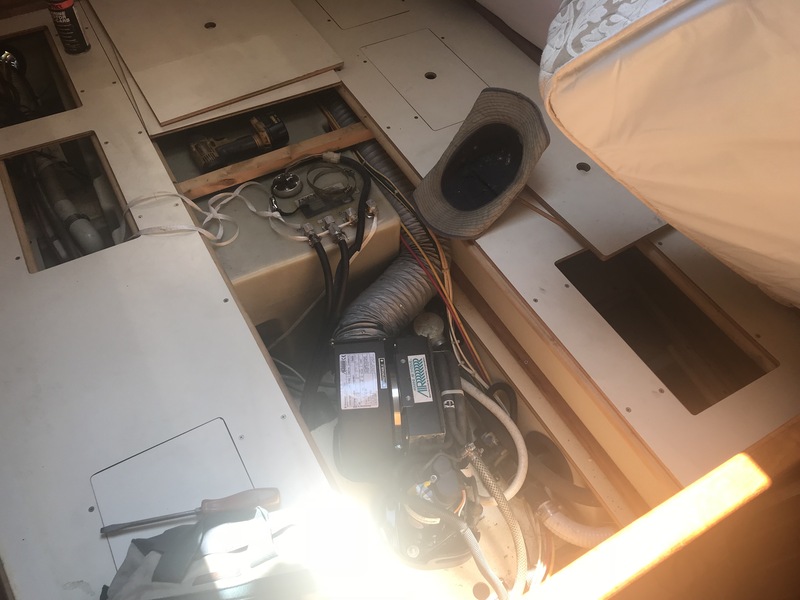 The total disassembly includes the rear panel on the engine room, the floor panel over the stuffing box, and floor panel behind the stuffing box, the center panel over the AC and the one behind it and the side Starboard side panels under the bed. The exhaust runs from the engine under the two panels and under the AC where the muffler is mounted. Behind the AC it connects to the long run where it goes through a fiberglass partition and ducks under the diesel tank. From there it heads out back where it is accessed via the starboard side swim locker. I think we’ve figured out why we were getting exhaust smell in the aft cabin. This is the short piece. The wire in the tubing was completely rusted through. Since installing the new hose its actually more quiet. Considering this section was right next to the shaft log I would have expected the surveyor to see it.